I've been taking a black & white darkroom class for the last few weeks. It's the second in a series, and the idea is to improve printing skills via supervised printing and demos of various darkroom techniques. There's no grade, not even really a pass-fail. The "assignment" for the class is to produce a body of work around some theme of your choice. At the final class, you're expected to submit at least five finished prints. My project was "Calla Lilies, Literal and Abstract". Mostly it was an excuse for me to buy macro gear for the Hasselblad and play around with it. Right now I have six finished prints that I don't hate, and a couple more that are at the darkroom drying. I could have just handed the instructor a stack of prints to review, and I'm sure that would have been fine. I expect that most of the students will do exactly that. That seemed to lack a certain... something. Panache. Style. Polish. 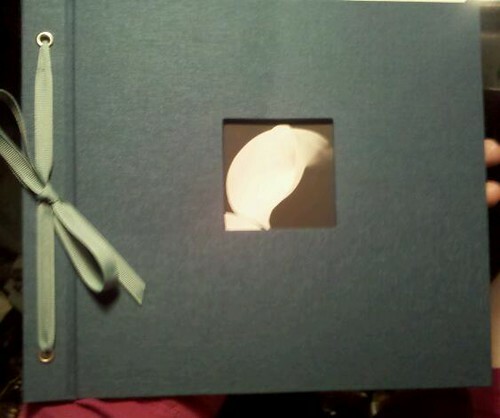 I just finished mounting my prints in a lovely slate blue cloth album. I'm trying to teach myself that style and presentation count, and this seemed like a good way to practice that lesson. I may not have the best prints ever, but I'm going to win on style points. Very nice. I can't tie bows worth beans.